New Ear Wax Removal Solution - Hi Tech? MAYBE. 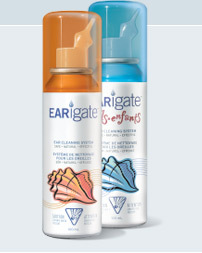 Earigate nozzle's patented duct system, developed by an ENT, ensures expels wax by projecting fluid into ear canal without forcing it against the tympanic membrane. Earwax blockage can lead to hearing loss and pain. *Observations based on patients treated by Dr John MacRae, developer of Earigate.